Junior Achievement of Hawai‘i Island congratulated outstanding young entrepreneurs and awarded $3,500 in scholarships at the 38th Annual “Futures Unlimited” Awards Banquet on January 30, 2018 at Sangha Hall. The Junior Achievement company program helps high school students develop leadership and entrepreneurship skills by guiding them through the creation of a small business, from product development to marketing and sales. The awards recognize the hard work of the students and advisors from local businesses. A familiar face returned home to Hilo to keynote the awards banquet. Jimmy Chan, founder of the Hawaiian Chip Company, is a 1993 Waiākea High School graduate and a Junior Achievement company program alumnus. He shared his entrepreneurial journey with the audience, and spoke about the importance of the lessons he learned through Junior Achievement. The three student companies participating in this cycle were Branching Out sponsored by Big Island Toyota, Young Creations sponsored by HFS Federal Credit Union, and Zenith sponsored by HPM Building Supply. Company members sold their products to friends and family, and to the public at a trade fair held at Prince Kūhiō Plaza in November. Over the course of the cycle, the companies sold over $31,000 in merchandise. Branching Out was named Outstanding Company Of The Year, and was also recognized for having the highest company sales at $11,652. Zenith was recognized for having the most compelling presence at the trade fair. There was a tie for Outstanding President – awards were presented to Daniel Briski of Young Creations and Brittney Williams of Branching Out. 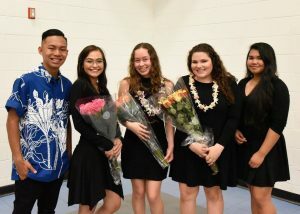 Outstanding Vice Presidents were also recognized for their contributions to their companies: Kanoe Kama (Branching Out – Finance), Kalsey Nacis Jr. (Branching Out – Production), Naya Nguyen (Branching Out – Marketing), Keziah Soares (Branching Out – Human Resources), and Kira Taylor (Young Creations – Public Relations) received the awards. $1,063. Other awards were given to Naya Nguyen of Branching Out for Outstanding Sales Presentation, and Brittney Williams of Branching Out for most products sold and highest individual sales at the trade fair. The Junior Achievement sponsoring businesses instill the value of community service in their own employees and set excellent examples for the participants. Companies collaborated with Hale Ānuenue Restorative Care Center, Operation Christmas, and an effort to send aloha to members of the U.S. military abroad. This year’s Community Service award was given to Young Creations in recognition of their exceptional contributions to the community. In addition to the awards recognizing achievement in the program, $3,500 in scholarships were awarded to six seniors who excelled both in the program and in other aspects of scholastic life: Crismel Juan of Young Creations (Kea‘au), Naya Nguyen of Branching Out (Waiākea), Princess Fatimah Rasalan of Young Creations (Kea‘au), Keziah Soares of Branching Out (Kea‘au), Brittney Williams of Branching Out (Waiākea), and Alfred Zuniga of Zenith (Kea‘au). This is the 29th year that Junior Achievement of Hawai‘i Island has awarded scholarships to participants. Junior Achievement is an organization founded in 1919 that fosters work-readiness, entrepreneurship and financial literacy skills in students nationwide. Locally, the organization is powered by members of Hawai‘i Island’s business community who serve as advisors, sponsors, and volunteers. To get Junior Achievement in your K-12 classroom, or to get involved as a volunteer or sponsor, contact District Manager Jeanine Acia at (808) 292-0570 or jahilo@jahawaii.org.